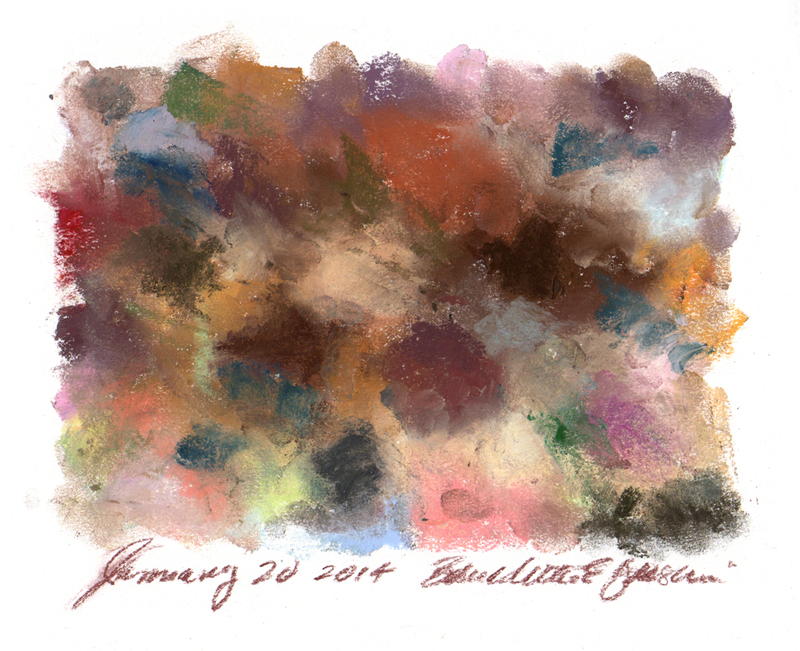 The illustration above is a sampler of all the shades of pastel I’ve used while painting portraits and sketches of people of all different “colors”, skin tones and ethnicities. Tell me, who is “black” and who is “white”? And what does “colored” mean? In truth, we are all “colored”. Each of our faces has the darkest and lightest tones and all those in between, and even some colors we’d be surprised to find in skin tones. I can tell you that all the colors I smudged there have appeared in the highlights and shadows and mid-tones of every face. It largely depends on where you are standing in relation to the light. Some people have suggested that Dr. Martin Luther King, Jr.’s dream of black children and white children going forward hand in hand, the ideal of seeing a person not for the color of their skin but for the content of their character, had the goal of a “colorblind” society. That’s a noble ideal on one hand, where we just don’t notice the color of a person’s skin in any situation and go on from there. But does that truly bring justice to wrongdoing and change society in a way that makes the injustice people have suffered because of that color unacceptable? To suddenly begin to ignore the color of a person’s skin and jump immediately to integration is to jump right over the injustices done to people because of the color of their skin. It’s also ignoring an essential part of another person, shutting the door on a section of their life, a part that makes them distinctive. King did not use the term “colorblind” in any speech or written document, but his point is described by historians as a more “color aware” society where we recognize our differences, celebrate them and thereby heal through those very differences among ourselves. When I create a piece of visual artwork I look for what makes the subject inspiring to me, what makes it distinctive, what makes me excited to share it with you. I like contrasts, I find what makes my subject different in its class, what makes it stand out from its surroundings. It’s my joy to find and share “the extraordinary in the ordinary”. If everything I painted looked the same, what need would there be for artwork? Looking at people has always been like looking at a field of flowers for me—I find it hard to settle on one before I skip to another while I enjoy the visually exciting effect of all those different colors and shapes and heights and structures. Then I can can pause on each one and get to know each in its own unique detail. When I rode the bus, long before I painted anything let alone a human portrait, I quietly studied all the faces around me for color and shape and texture, eye color, the hair that framed it, accessories and jewelry, and was often started by a stern expression of someone who didn’t understand why I studied them so intently. I was just looking for the things that made them unique and beautiful—not in the classic sense of beauty but in the classical sense, in that beauty is truth, in being true to who we are inside showing that on the outside, like the flower in the field that can’t help but be what it is. If we are colorblind, we intentionally ignore some of the fundamental differences that make each of us irreplaceable. That denies a basic part of our personal existence and of human existence as a species; it denies a portion of our very identity as an individual. That takes an awful lot of effort. Why not admit to our differences and get to know each other in full, and find the beauty in each of us. We have always been and will always be different from each other and might as well get used to it. This 1996 essay entitled “Misusing MLK Legacy and the Colorblind Theory” explains more about King’s “color awareness”.